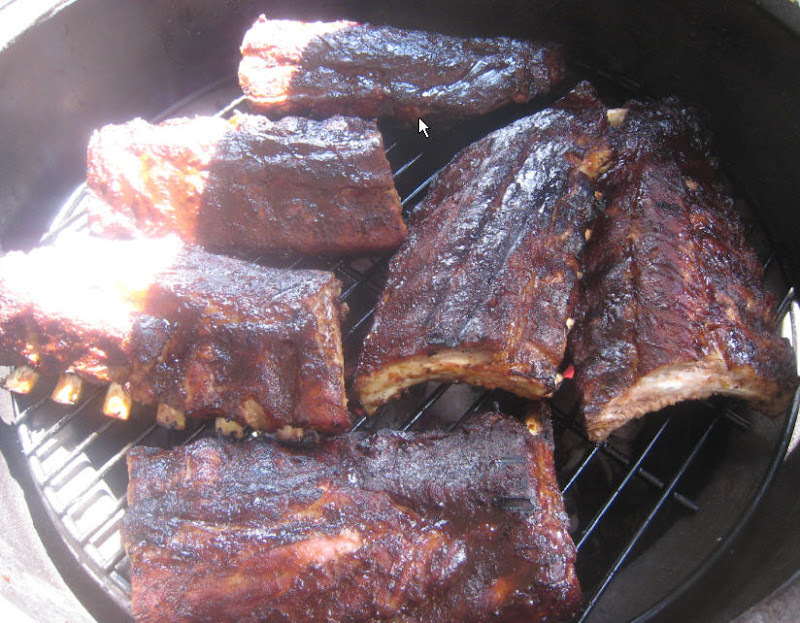 Well the lessons worked, the preparation was much more than I generally do for pork spare-ribs, the glaze was a different approach and I used a different rub than I have EVER used in the past. We went store-brand on the sides, but I made some killer baked beans to serve with the dinner. We had our cousins from Ohio visiting town so they came over to share the bounty, they brought potato salad and slaw from the Publix. We opened a jar of Mickle's Pickles to go with our ribs. Some tea for some, some wine for others and a good, relatively easy meal but for the ribs. I love the idea and the results of the glaze, I could have dusted on a bit more of the rub in between glazes to give the ribs more punch. They were really delicious. I mean really delicious. Here is a picture of them. Cool. So did you buy the St. Louis cut or trim them yourself? I did 'em myself.. saved all of the trimmings to go into a big Mexican pork something later on. Though I didn't weigh the before and after's, I'm guessing that over 1/4 of the weight of the whole rack went into the trimmings bag, maybe more with that big chine bone and all? Is this change of direction coming more from the competition folks or the BGE classes? Or some of both? 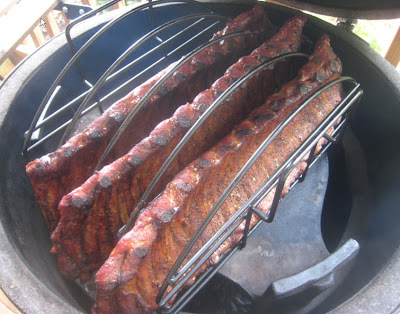 Until I get new inspiration (hint), I'm doing the 3-2-1 method or in the case of baby backs closer to a 2-1.5-.75. I haven't tried my newer method on Baby Back ribs.. I think your timing will be right on? 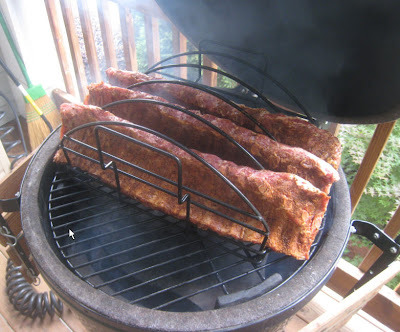 I do like the double tiered flat rack that clamps on the main grill on the Big Green Egg, though I have done ribs for 20 years in a stand-up rack (like the one you are showing), the last ones I did were so good I may have to switch to the "flat" rack from now on? The flat rack does let you sop on the glaze (not BBQ Sauce), toward the end of cooking, and I like that..
Because the consumers are expecting it, I'll be using a thinned BBQ sauce on these. When they come out of the foil being steamed, I'll remove the plate setter for some direct heat/flame, cut them down to half-racks, and put them on the grill for some sauce and a little bit of crust. 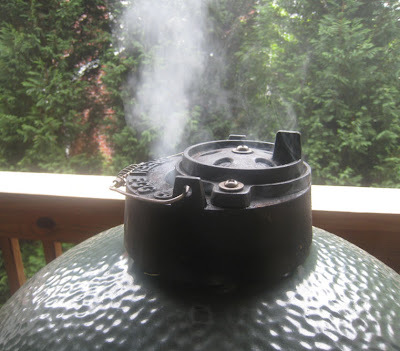 Though I am still feeling pretty punk, I am slow-smoking all of the trimmings from the spare ribs I converted to St. Louis style last week or so.. I know some of the thin chunks will come off in an hour, but I'm thinking that there is plenty-O-meat to toss into a Chile Verde or something later on.. They HAD to be cooked.. I ad-libbed a rub (combined 3 that I had).. but I measured out the amounts (CP did the measuring), so in case they are way good I can go back to that rub again. I just had to slice off a chunk of the well seasoned bit and pieces and taste it.. I hope I don't suffer for it, but it was way good..
pictures coming... it looks like Junk on the grill, but it will be good cooked with something else later in the week.. I think I'm having some boiled chicken breast tonight, along with some soft rice, and some overcooked (soft) vegetables.. Tomorrow or later in the week I'll be experimental.. These turned out pretty darn tasty though I only had a bite or two.. This will be good use to the trimmings from the LARGE racks of spare ribs.